Place salmon in baking dish and season with salt & pepper; bake at 350° until medium-rare. Cool completely and flake into a bowl. Add lemon juice through cilantro and 1/2-cup of the bread crumbs to the flaked salmon. Mix gently but thoroughly. Form mixture into small 1 oz cakes and place on a baking sheet; chill for l hour. 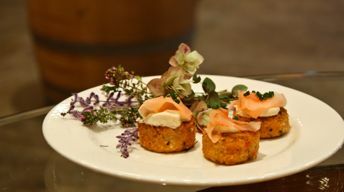 Lightly coat salmon cakes with remaining cup of bread crumbs. Heat non-stick sauté pan over medium-high heat; swirl in vegetable oil. Sauté the cakes, a few at a time, until golden brown on both sides. Transfer to serving platter and continue frying remaining cakes. Top each with a dollop of ginger aioli and reserved chopped cilantro.